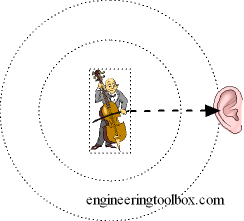 The sound pressure from a source is reduced with distance from source. The directivity coefficient depends on several parameters - the position and direction of the source, the room and the surrounding area, etc. Note! - a doubling of the distance from a sound source - will reduce the sound pressure level - Lp - with 6 decibels. Engineering ToolBox, (2005). Abatement and Distance from Source . [online] Available at: https://www.engineeringtoolbox.com/abatement-distance-source-d_723.html [Accessed Day Mo. Year].